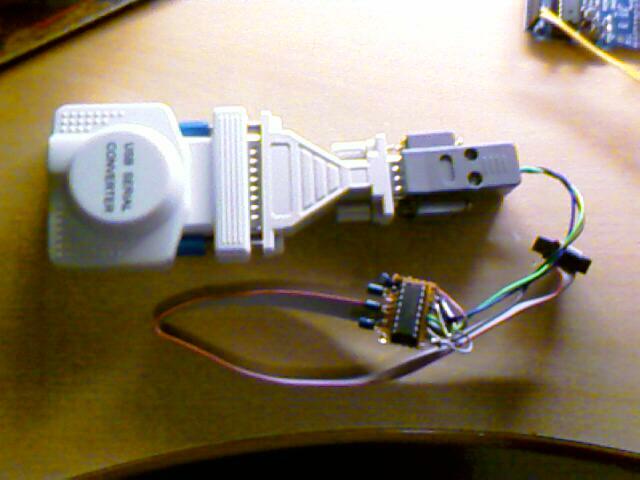 This is the USB to Serial to ttl levels convertor used to access the serial port on my FON wifi router. I built it to downgrade the firmware then apply a hack to install a set of addons to give more control and monitoring on the fon router. In effect, it created an expert mode! The cable above was plugged into a usb port and my FON router. Using windows hyperterminal I was able to get access to the serial console of the router and gain access to the boot loader. With access to the boot loader I was then able to re-flash the firmware to a lower version, alter the default DNS server IP address then allow it to ‘upgrade’ itself. The upgrade used the alternate addons server and eventually the firmware was all upgraded. The new gui is very similar to the original but with a lot more options for configuring the wireless access, firewall rules and much more. I’ll try to get a few screenshots at somepoint in the near future. I’ve now ordered a second router just to ‘play with’ further.